CAMDEN - The most widely publicized unsolved mystery in Arkansas is the disappearance of Maud Crawford from her Camden home Saturday night, March 2, 1957. Crawford, 65, was a civic leader and highly respected lawyer for 41 years in a prominent Ouachita County law firm in which United States Senator John L. McClellan was an inactive partner. She was a stable, responsible person and there seemed to be no reason for her to vanish of her own volition. She was well liked in the community, having been the only women ever elected to the Camden City Council. There appeared to be no motive for foul play. Now, 29 years later, it has been discovered that a multimillion-dollar estate was a hotly contested issue in Crawford's professional and private affairs before she disappeared. Numerous interviews and records in the Ouachita County courthouse reveal that Crawford was involved in a complex and bitter controversy with Henry Myar (Mike) Berg, now deceased, a member of the Arkansas State Police commission. He was appointed in 1955 by then-Governor Orval E. Faubus and remained a commissioner until shortly before his death in 1975. The dispute arose from an estate that belonged to his aunt, Rose Berg. The estate, consisting of vast land holdings, oil and timber, was worth an estimated $20 million. Sources who were close to the situation at the time say Berg believed he was entitled to the fortune because his father and uncle were partners in a joint venture called Berg Brothers. Crawford was Rose Berg's legal adviser, close friend and across-the-street neighbor. Rose Berg and her husband, Henry Lyon Berg, had no children. When Henry Berg died in 1950, he owned thousands of acres of land, city property, millions of dollars worth of blue chip stocks and bonds and interest in oil royalties. His will, witnessed by Crawford and likely drawn up by her, left a three-quarters interest in his assets to his wife, Rose, and a quarter interest to his nephew, Mike Berg. The will also named Rose Berg co-executor of the estate with George Bowers, an accountant and protégé of Henry Berg who had managed assets for both Henry Berg and Mike Berg since 1939. Rose Berg was 70 when her husband died. Since she had no children and was in poor health, the question arose as to who would inherit her interest in her husband's estate, worth about $15 million, as well as assets of an estate in her own name worth $5 million. Several persons say Rose Berg left a will, although it cannot now be found, that named three nieces on her side of the family to inherit her assets. Two of the nieces, Jeanette Simpson and Marion Peltason, lived in California. The third, Lucille Glazer, lived in Michigan. 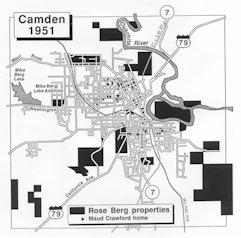 Rose Berg's only relative living at Camden, Berg, reportedly was not mentioned in the will, even for a nominal gift. If Rose Berg's will had been allowed to stand, not only would Berg have lost the three-quarter interest in his uncle's estate, but management of his previous inheritance, the one-quarter interest, would have been complicated by having to share ownership with out-of-state relatives. Sources say the situation was unacceptable to Mike Berg. Stanley R. Peltason, husband of Marion Peltason, now deceased, recently was interviewed about the will at his home at Santa Barbara, Cal. "You have to go back all the way to the Depression years when Mike's father, Leo Berg, and Henry Berg were partners," Peltason said. "They had holdings all over the state of Arkansas. Mike always contended that it was his father that saved the partnership, and although Mike inherited one quarter of what Henry Berg left when he died, Mike told me, "I think I should be entitled to all of Uncle Henry's estate, and by God I'm going to get it." Although Rose Berg's three nieces had unsigned copies of her will, a signed copy was reportedly in her safety deposit box at a bank in Camden. Other signed copies were with George Bowers in the Berg business office and probably with Crawford. All signed copies of the will disappeared when Crawford vanished and the nieces were unable to prove they had existed. Lucille Glazer, one of the three nieces who was to inherit the estate, recently spoke in a telephone interview from Sarasota, Fla., about the will. "Aunt Rose had made a will with Maud Crawford. At one time we had a copy of it. Aunt Rose gave it to my mother [Rose Berg's sister]. It left the estate entirely to Jeanette, Marian and me," she said. Peltason also spoke of the will. "George Bowers had a signed copy in the Berg office and showed it to Jeanette [Simpson, one of the nieces]," Peltason said. "She had left everything to Jeanette, Lucille and my wife. She passed up the other part of the family. Another copy was always in Rose Berg's safety deposit box. Then, all of a sudden, there's no will in there." The existence of the will was confirmed in an interview in December with George Bowers, who was ill at the time in a nursing home in Virginia. Bowers died three weeks after the interview. The will became critically important to the question of the inheritance of Rose Berg's estate because she became mentally incompetent years before her death in 1962. Several people who were close to Mrs. Berg said she began to show signs of mental incompetence in the 1940s. By 1954, she required round-the-clock nursing care. Dr. Tom J. Meek, a Camden physician who examined her in 1955, said recently that "she just couldn't remember anything. I would say almost like someone with Alzheimer's disease. Of course, we didn't know anything about Alzheimer's disease then." He said she could not carry on a coherent conversation. "She just couldn't cogitate very well," he said. In addition to her mental condition, it is said Rose Berg knew little of her husband's business affairs and was not qualified to manage them. She relied heavily on Maud Crawford. 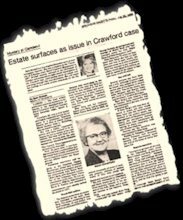 Evidence indicates that Crawford, widely regarded as the best title and abstract lawyer in Ouachita County as well as an expert in estate administration, considered her responsibilities to include the protection of Rose Berg's nieces' interest in the estate. Sources say George Bowers, co-executor of Henry Berg's estate, and Thomas Gaughan, a partner in the law firm where Crawford worked, had a close working relationship with Mike Berg. Gaughan was a long-time attorney for Berg. The sources say that Gaughan was sympathetic to Berg's desire to acquire his aunt's estate. Gaughan's involvement presented a grave complication for Crawford. Not only was he Crawford's employer, but ethics prohibited Crawford from taking action against a client of her firm - Mike Berg - and any informal actions had to be discreet. Thus, the feud was not common knowledge at Camden at the time. Interviews of the family members and participants in the feud indicate that Crawford was passionately dedicated to the rights of the nieces and that she was actively involved in an attempt to thwart Berg. Accusations of thievery flew back and forth. There were reports of negotiable bonds as well as stocks disappearing from Rose Berg's safety deposit box. There were claims of oil royalty checks being cashed illegally for Mrs. Berg. A source close to the family, who has asked not to be named, allegedly was told by Thomas Gaughan that Berg removed a number of Rose Berg's bonds from her safety deposit box. "Mike moved some bonds out of Rose's safety deposit box and told Thomas about it," the source said. "Thomas said, 'My God, Mike, if you don't get those bonds back in the bank by tomorrow morning when the bank opens you're going to go to prison.' It took Thomas two hours to make him realize it," the source said. Finally, three deeds were drawn up that simply conveyed the bulk of Rose Berg's assets to Mike Berg. One of them, an eight-page deed, was dated 1951 but was not publicly recorded until 1954. 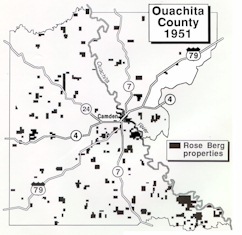 With a single signature Rose Berg conveyed 21,211 acres of land, much of it valuable oil properties and city real estate, to Mike Berg. It was notarized by Mike Berg's bookkeeper, Cameron Allen, now deceased. The question raised by relatives was whether Rose Berg knew what she was doing when she signed the deed. Shortly afterward the deed was discovered by Sam Schleifer, son-in-law of one of the nieces. "It came as a shock that time when I checked with the courthouse and found that it had all been transferred," he said recently at his home in Ventura, Cal. "Aunt Rose was incompetent. She did whatever you told her to do." To help them in their fight, the nieces had only one ally in Camden - Maud Crawford.